The TI-5045 SV (SuperViewTM) replaced the short living TI-5045 IIA and could be called a TI-5034 SV with two colour printing. Dismantling two TI-5034 SV reveals a surprise, they use different printed circuit boards (PCB's). The elder calculator, manufactured already in July, 1993 makes use of a Toshiba T7872-0016 single-chip calculator circuit. The later one, manufactured early in 1996 uses the TC-83220-0027 circuit. We could assume that Toshiba simply renamed the old chip. The UL-File number E122921 is unfortunately not active, we can't reveal the manufacturer of the calculator. Don't miss the database of all known UL-File numbers found on Texas Instruments calculators. Just to be complete, the elder TI-5045 SV was manufactured for the German market and bears the GS-Logo instead the UL-Logo. 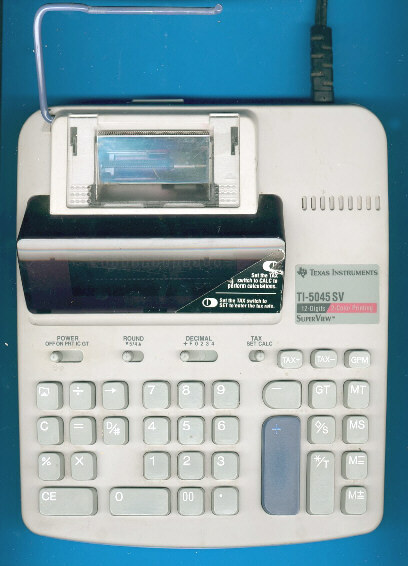 The TI-5045 SV is featured in the Texas Instruments Incorporated sales catalog CL-1233 dated 1994.